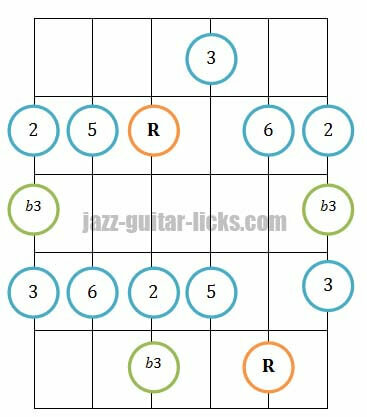 The major blues scale is one of the most important blues scales that any jazz guitarist must know. This is a useful device when you want to improvise over major or dominant chords and give bluesy vibes to your guitar solos. 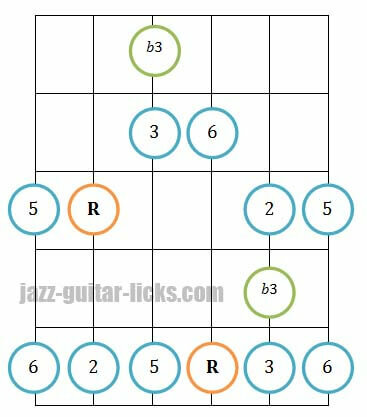 How Is Built The Major Blues Scale? 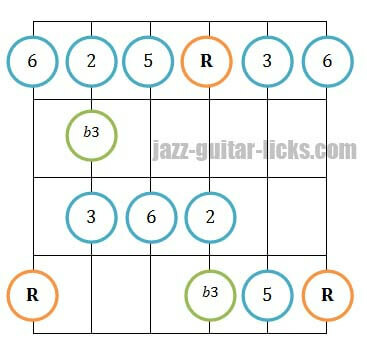 This is a hexatonic scale, it means that it contains six notes per octaves just as the minor blues scale. In comparison with the major pentatonic scale, there is an additional note between the second (2) and the major third (3). This note is named flat tenth (b10) or flat third (b3), this a blue note. Flat tenth is more appropriate in this harmonic context because a scale can't have two thirds in its composition. 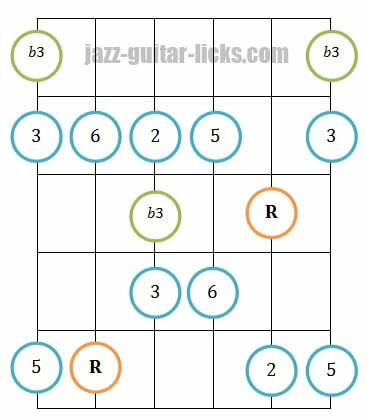 In brief the major blues scale is made up of : root (1), major second (2), a flat tenth (b10) or minor third (b3), major third (3), fifth (5) and sixth (6). 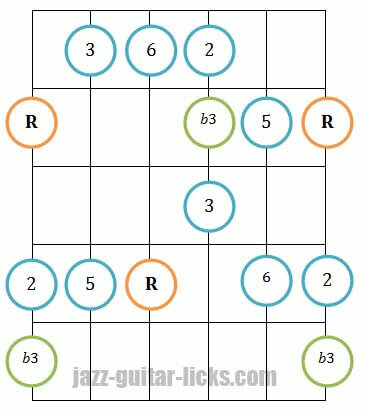 Here are five guitar positions of the major blues scale. The first important thing to do is to locate the root note (R), this is the orange note in the diagram, it will serve as basis for the transposition of this scale. You can also locate the blue note (b3), that is the green note in the diagrams. Please note that these guitar positions are the same as the major pentatonic scale positions but with the blue note added (b3). Once you have memorized these diagrams you have to transpose them by moving the root on the desired note keeping the same intervals. Indeed, you must play this scale in twelve keys.